The morning briefing and the return of Wenvel. Kos' first day on the job. It consists of a morning briefing full of lame jokes that get polite chuckles, and overview of the state of the 10th district of Ravnica, and the promotion of Borca to start his Lieutenant training... under Kos to replace Kos... which means they're still partners. It seems like there are even more new recruits that need training and some attacks on the new influx of tourists by a Gruul clan led by someone named Verzit. As the morning briefing ends, Phaskin is waiting outside ready to pass off a new case to Kos. It turns out Wenvell isn't dead, and he's come to the wojeks for assistance. (Why did it take so long?) As he begins his explanation, the ghost of his wife, which is now a woundseeker, and particularly violent variant of ghost, appears ready to attack her husband. Man in charge Kos pulls out his police baton, and it turns out it does more than club people. With a twist of the hilt, and the focusing of mana, an energy beam shoots out and destroys the late Mrs. Wenvel. 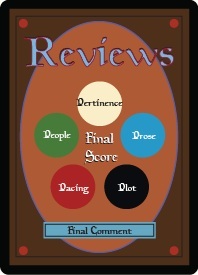 Wenvel explains as best he can, but it turns out his best isn't good enough. 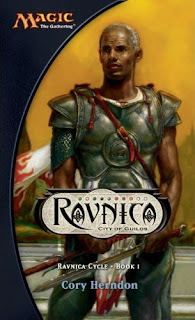 Kos explains that in this strange land that is Ravnica, attempted murder is a crime, but actual murder is not, unless it's Guild related, and both he and his wife are not of any guild. There's nothing more they can do for Wenvel. The chapter closes with Kos wondering what it would be like to be out in the rest of the world, and perhaps be a part of the volunteer lawmen known as the Hazda, but then concludes that he's never been out of the main city, and he sees no reason to do so now. He had to get through an hour of the most painful mental torture ever devised by teh Azorius buresucracy, and those people knew mental torture. The morning brief. Humor is a hard thing to pin down and is subjective, but this was definitely not a high point for me. It's like a bad lawyer joke. The opening quote, "Don't wake me for the morning brief. - Epitaph of Wojek Sergeant Yrbog Vink" was already good enough to set the stage, and did get a smile out of me. It didn't need to be completely spelled out some more just three paragraphs afterwards. Now what did we learn in this chapter besides being reinforced that the decemillennial is close at hand, and the Selesnya have some special Convocation to perform? Not much. Wenvel came and went and nothing was resolved. Phaskin was waiting to "ambush" Kos to give him this case, and then after it's evaluated it turns out the case isn't a case at all. Is there something huge I'm missing? It is surprising that Wenvel is still alive. 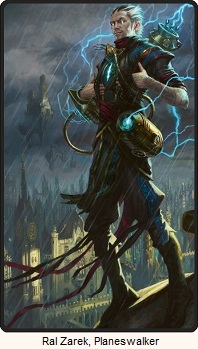 Perhaps Wenvel is no longer Wenvel and is a Dimir Doppleganger of some kind. Or perhaps the raids on tourists by the Verzit's gang is a seed that has yet to grow. We'll just have to find out.